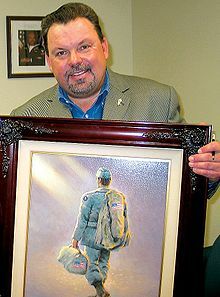 I read, with some sadness for sure, that Thomas Kinkade has died at the age of 54. The self-described "painter of light" has become very popular over the years with many Americans for his warm, down-home style art. Critics have often taken a negative view of his work -- but what do they know? How many times have I seen a movie that was not rated so well by critics that I (and often those with me) have really enjoyed? The fact that so many people enjoy his art work and cherish his paintings enough to hang in their homes speaks volumes to their value as art. I may not be an artist, but I know for myself that viewing art should spawn emotion -- feelings and thoughts of cherished memories of days and events past and hope for those to come. If it doesn't -- if it just depicts something with some sort of 'artistic accuracy' then perhaps it is really just a rendering and not art at all? I know that Mr. Kinkade's paintings always cause me to stop and think with some measure of pleasantness about the subject matter. That is more than I can say for much of what others call "art." Regardless of one's opinion of what constitutes art (which will always be debatable without end), let us at least acknowledge that the world has lost somebody whose contributions have helped a lot of people recall pleasant memories and, in general, just feel good. I became acquainted with his story a few years ago when I watched the movie "A Christmas Cottage." I found the story to be heart-warming, humorous and uplifting with a happy ending (something sadly missing from many of today's films). How many times I have seen his paintings and enjoyed them without realizing that they were his is unknown to me. I also did not know until I read an article on the Huffington Post this morning that he was a devout Christian. Given the warm, family-friendly nature of his art, that comes as no surprise to me. At this point, it is unknown what caused his death, other than the statement that it is believed to have been brought about by natural causes. I have a little clock on the wall whose face is a painting of his called "Friendship Cottage." Suddenly this cheap plastic clock just gained a little more value to me (as did the coffee mug with a painting of his on it that resides in our kitchen cupboard). I shall look around for a nice print of his to hang in our house in honor of his memory and contribution to this world. It is sad to think that we will not know any new art work from Mr. Kinkade. He now paints on a heavenly canvas.